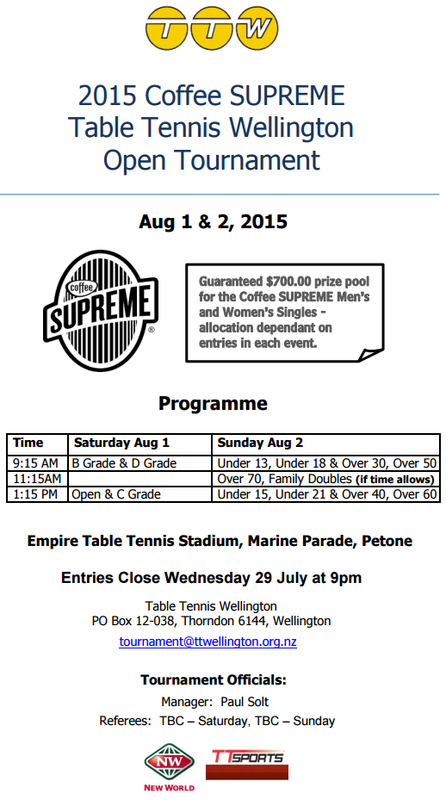 We are pleased to announce the 2015 Coffee SUPREME Table Tennis Wellington Open Championships. The full details are here with the: Entry Form & Conditions. This will be held at the Empire Table Tennis Stadium, on Saturday/Sunday 1 & 2 August. Entries are due to Paul Solt on tournament@ttwellington.org.nz or 04 566 8724 by 9pm Wednesday 29 July. Coffee Supreme is an independent specialty coffee roaster supplying cafes all across New Zealand and Australia. Be sure to visit the Coffee Supreme New Zealand online store where you can get fresh coffee delivered straight to your door! Thanks also to TTSports and New World for their support. NOTE: Family doubles can be any mix – parent and child or grandparent and grandchild or sibling and sibling or aunt/uncle and niece/nephew etc.